The Sun Dolphin Aruba 10 kayak has gained a lot of attention for all the right reasons. The Aruba 10 has dozens of features to endear it to beginning and intermediate kayakers. Whether you want to use a kayak for weekend cruising or angling, the Aruba 10 fits the bill. Note this kayak is also available in eight foot and 12 foot lengths. One of the most successful mid-level kayaks on the market today, the Aruba 10 we’re reviewing is a stylish blue (although it comes in several colors, including green and red). Constructed with rugged Fortiflex High-Density Polyethylene, it can withstand any or obstacle or weather condition it encounters. The Sun Dolphin is UV-stabilized to prevent damage from long days out in the sun. The Sun Dolphin Aruba 10 has a load capacity of 250 pounds, and the kayak weighs 40 pounds. There’s a large open cockpit featuring a padded seat with adjustable foot braces and back support. It’s easy to get in and out of the kayak, and there’s little room for water to get in the seating area. The seating area measures 17 inches wide and by 35 inches long. This Sun Dolphin Aruba 10 review will address the pros and cons of owning this lightweight kayak so you can make an informed decision when you are ready to buy a recreational vessel. The kayak’s flat bottom hull increases agility and helps the boat resist heavy winds. You’ll have no trouble turning the kayak in a hurry if you need to avoid obstacles. And if you do encounter turbulence or trouble, you’ll be able to slip out of the cockpit without much effort. Unlike many other flat bottom boats, the Aruba 10 tracks well when going straight. It won’t wiggle right and left when you paddle. This kayak is made of high-quality plastic, which is quite buoyant. The Styrofoam blocks in the rear of the kayak provide even more buoyancy. You can add an extra block if you feel the vessel still isn’t buoyant enough for you. The Aruba 10’s modified polyethylene shell offers a firm structure underneath an easy to handle, lightweight vessel. Even novice users can feel safe using this kayak without fear of capsizing. This high-performance kayak has a slim bow and stern design to improve tracking. You spend less time maneuvering this boat and more time angling and enjoying the scenery. Despite its low weight, you’ll get more stable tracking than you’ll find in more expensive competitive boats. While it is possible to use the Aruba 10 on rapids, the manufacturer recommends it for cruising. The Aruba 10’s lightweight body slices through the water instead of pushing and maneuvers like a pro kayak. While it is not recommended for rapids, more confident users can guide it through choppy waters and stay upright and dry. You may be able to use it in Class 1 rapids if you’re skilled enough, but it’s not suitable for Class 2 rapids. Anglers can easily customize the Aruba 10 to create a fishing vessel. You can attach rod holders and fasten outriggers to the side of this kayak to help you reel in your catch. After doing a few modifications to improve the basic kayak, you’ll have your own fishing machine. Recreational kayakers like the Aruba 10 because it’s lightweight and they can transport it without problems. Anglers appreciate the many helpful features, including its safe and sturdy cockpit and oar holder, tough polyethylene hull, and its ability to move smoothly. Anglers and recreational users can store gear in the covered storage space behind the seat keep a few accessories on the floor by their feet. The amount of storage space could use some improvement for anglers, but it’s more than enough for recreational kayakers. Users over 5’8” may have a hard time turning around in the cockpit, especially if they fish. The movement shouldn’t be a problem if you’re just cruising, or if you’re shorter. Although you can run the rapids with the Aruba 10, remember it is designed as a flat water kayak. Be cautious when waves are higher than a foot. There’s no keel on this kayak, so if you run into vigorous waves, you will get tossed around a bit. The kayak has a paddle leash so you can hold on to your oar while on rough waters, regardless whether you’re cruising or catching fish. The overall design makes the Aruba 10 look like it has wings to fly through both calm and trying water environments. You can take it to rivers, lakes and strong currents, but it is primarily for use in calm water. The quality materials and workmanship go a long way to make the Aruba 10 an excellent first choice for new recreational kayakers, and the comfort factor seals the deal. Take this kayak as is if you’re a weekend cruiser out for fun and a view of scenery along a lake or river. Anglers who can take time for some DIY improvements or make do with the kayak’s recreational basics will enjoy taking the Aruba 10 for a spin. For a more comfortable ride, the black plastic foot pegs slide back and forth and click into a slot on the floor. Lightweight – This kayak is easy to maneuver and lightweight. Users new to kayaking will find that the lack of advanced bells and whistles a plus. There’s nothing to distract you from paddling and fishing. Constructed from tough material – The hull areis made from high-density polyethylene, one of the most damage resistant materials used to build kayaks. Ample storage – This 250-pound capacity kayak has enough storage for anything you need to take with you on a day trip. It comes with a Portable Accessory Carrier (PAC) which you can use as a backpack, storage space or tow behind. Comfortable seating – The open cockpit has plenty of legroom to allow even larger kayakers to enter and exit the boat. The seating area has adjustable footrests and protective padding for your thighs to keep you safe and will enable you to customize the cockpit to your needs. Easy to transport – This Sun Dolphin kayak has extendable handles making it easy to carry from the car to the shore and back again. All-around design – The Fortiflex High-Density Polyethylene hull and backbone, sturdy, safety oriented cockpit and paddle leash work together to make the all-around design enticing enough for most budget kayakers. Safety accessories – There’s a built-in spray deflecting collar to keep you dry, and you won’t find that on many other kayaks. 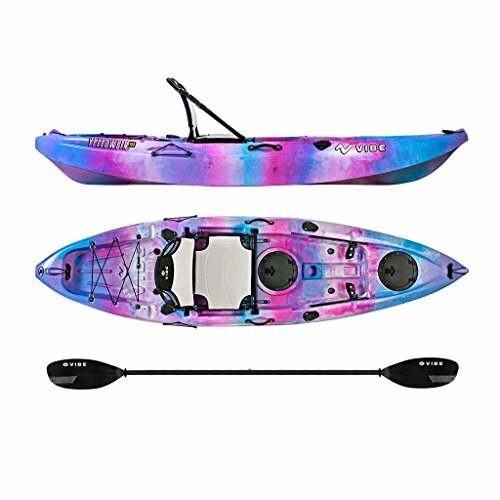 The bright contrasting color scheme makes it easy for other kayakers and boaters to see your vessel, reducing accidents. Most Sun Dolphin Aruba 10 reviews by customers give it good or excellent ratings, whether the primary function is cruising or fishing. 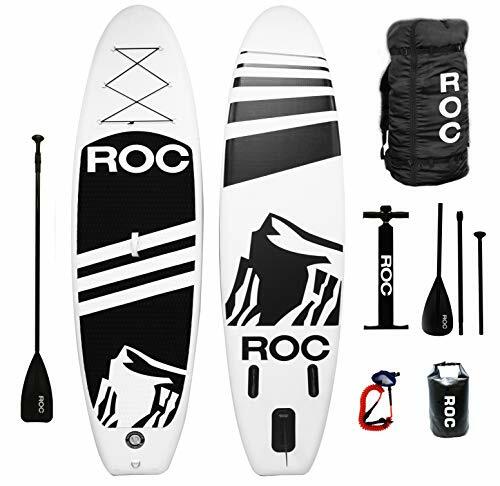 A fun kayak and quite durable for the price range, says one customer. Many owners write that the Sun Dolphin Aruba 10 is fun to use. Some users say that you can bring the kayak out into the water and stay there for as long as five hours straight without feeling uncomfortable. Although the load capacity is 250 pounds, reviewers who weighed 290 pounds and 325 pounds wrote that they used the kayak with no problems, but that people over 300 pounds should use a higher-capacity kayak. You can take the Aruba 10 out on an ocean or waterway, but be cautious, a few customers warn. Bring a lifejacket and paddle leash, they add, when riding on these waters. Users like the Aruba for paddling on mellow lakes, streams, and rivers. A few customers say that the kayak is ill-suited for high-level rapids or rocky creeks. It may turn sideways if you’re paddling on a river and stop for too long, writes one customer. On the plus side, the customer adds, you can use this boat on long trips, and it will endure heavy handling. Many customers feel comfortable enough with the Aruba 10 to take their children and grandchildren out kayaking in it. The Sun Dolphin Aruba 10 kayak is adaptable to many kinds of water, and you can use it for angling or a leisurely cruise down the river to look at the scenery. This inexpensive vessel can be customized into a fishing kayak. Rehabbing the boat may be worth it if you plan to use it for occasional angling. You may need to look for a kayak designed explicitly for catching fish if you’re an avid angler. The Aruba 10 is an excellent performer, and it’s easy to navigate. The lightweight body makes it ideal for beginners, and intermediate kayakers., The Sun Dolphin Aruba 10 reviews from customers confirm that this is an essential kayak with good tracking and extra safe, comfortable seating.